High-quality pickup system for acoustic guitar. With blend, bass, contour and treble control sliders, 250Hz-10kHz contour frequency. Supports feedback-fighting notch filter and volume control, with phase switch. 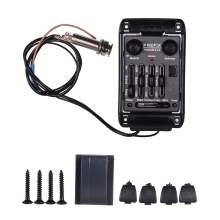 Supports tuning function, with LED display showing the tuning information.